Tahlequah carried her baby across the sea. She labored to push the weight of her against currents, diving deep, lifting her above the choppy waves, up toward the sky and light and air. Tahlequah is every mother who has felt the burden of her responsibility. Did you notice it, the weight, the first time you held him? The way he sunk into your arms, squirming? Do you notice how palpable her weight is when she is asleep, limp limbs and dimpled fingers resting, heavy, on your chest? The way his body slumps as you lean to rest him in his bed? Have you recognized, yet, that, circumstance aside, you would replay these motions over and over, no matter how exhausted your limbs become, how little patience you have left, or how heavy your child is now? And so, Tahlequah carried her baby, limp and sinking, lifeless, against the current, as so many mothers have, and will, and are. 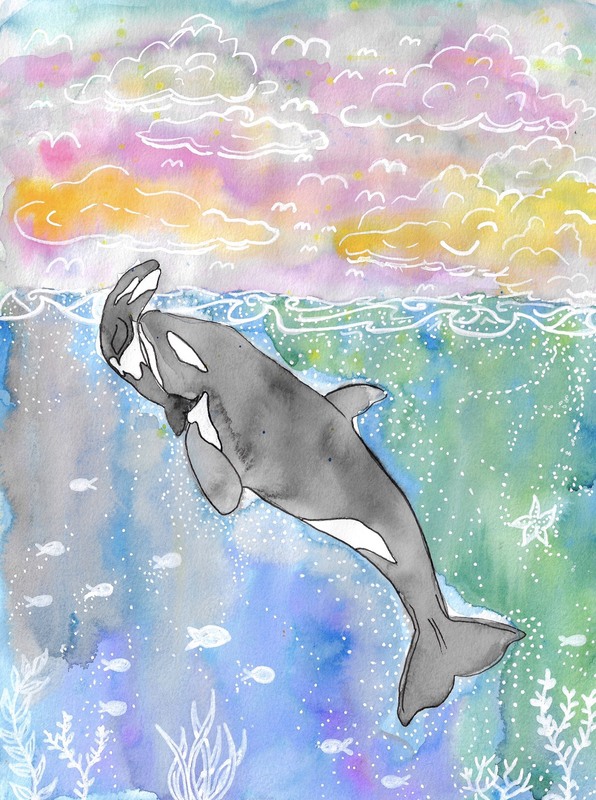 Legend has it that orca whales carry the history of our ancestors and of the earth. They are revered as symbols of power and strength, family, community, and protection. Their role is to protect and to guide us back home when we are lost. Tahlequah’s baby lived for half an hour. Although it’s not unusual for some mammals to carry their lost babies with them, Tahlequah carried her baby on a mourning tour for an unprecedented 17 days and for more than 1,000 miles in oil-laden waters, devoid of enough fish to feed the pod, let alone a grieving mother whale. She is, in many ways, and in this very moment, every mother who embodies Tahlequah’s power, determination, and strength with every breath. Pushing babes forward despite all odds, urging them upwards so we can breathe, forging ahead. Haven’t we all, in some sense, carried our own babes across seas and deserts alike? Exhausted and hungry, Tahlequah carried on. Members of the pod stepped in to help her carry her baby, allowing Tahlequah time to recharge, ensuring the continuity of the family unit. In a very real sense they were allowing her to rest, to breathe, while they carried her sorrow across the sea. A mourning mother, supported by the women around her. We do this, though, don’t we? Exhausted and starving—we carry our babies through sickness, death, hunger, happiness, loss, monotony, joy. Single mamas especially feel this weight—the responsibility of so often being the one to keep pushing forward. And for a few strong mothers, our pods keep us afloat, too, lifting us to the surface, taking deep breaths, and pushing forward. Massachusetts senator Elizabeth Warren, herself a single mother of two young children at one time, almost left her law career during a period when she was struggling to balance child care, work, and motherhood. In that moment, her aunt packed up her life, flew across the country, and moved in with Warren, helping Warren find the balance she needed to keep moving forward. Page adopted her now-20-year-old daughter as a single mom. She says, “My mom packed up, moved from the Midwest to California, and was granny/nanny to my daughter until my daughter left for college last year.” For a single mom, child care can be the proverbial straw that breaks the camel’s back, and having someone help is indispensable. These stories pay witness to and honor the struggle that is motherhood as a whole, but especially that of solo motherhood. These women support us, carry our grief, cheer us on, wash our feet, clean our houses. They put our lives back together, one gesture at a time. If orcas represent power, strength, and community in the sea, surely single mothers represent the same on land. How long can we truly stay underneath—how long can we wait to breathe—without our pod swimming by and carrying the weight of this beautiful mess of a life with us? And in those few, brief moments, we float uninhibited, weightless, breathing deep. Until, suspended, we forge forward, a little lighter. *Names have been changed to protect each individual’s privacy.